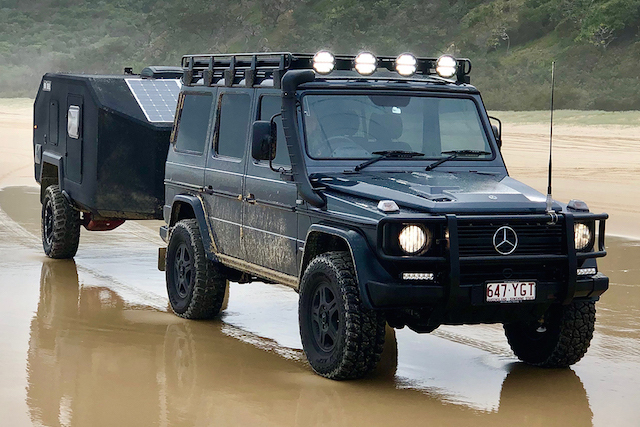 The team at Australian outdoor company Bruder has introduced the EXP-4 performance trailer, a towable carry-all that adds another dimension to off-road adventures. See the video. The EXP-4 is a smaller version of Bruder’s recent EXP-6, a 6.7m-long, self-contained trailer described as being ‘built for the Apocalypse.’ EXP-6 can sleep six and is being trialled by military units across the ditch. 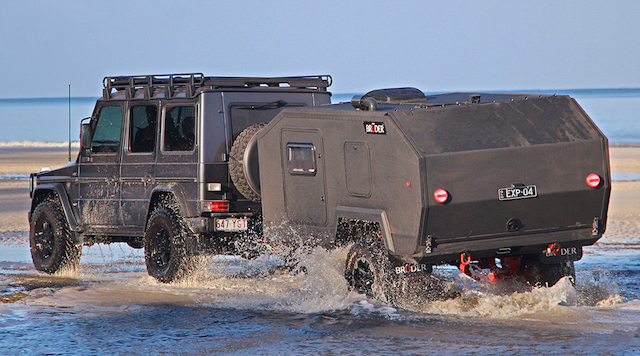 EXP-4 sports a high-tensile steel suspension system and 300mm of adjustable wheel travel that keeps the trailer level and safe in unpredictable conditions. It is outfitted with full-width kitchen area, storage compartments, a 60-litre fridge, and easily accessible rear storage that packs up in seconds. The sleeping area is 1800mm by 2100mm. The trailer’s exterior is 60mm-thick closed-cell composite. The EXP-4 is designed to pass Australian, US, and European road regulations. Price is around $NZ57,000.